Farm seekers and landowners will make valuable connections at a free workshop on March 6, 2018 from 6:00 – 8:00pm at the Throwback Brewery, 7 Hobbs Road, North Hampton, NH (snow date March 27). 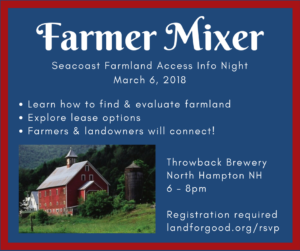 NH farmers will get help from local groups of farm service providers to learn how to find and evaluate farmland, explore leasing and financing options, get help if taking over a retiring farmer’s operation, better understand conservation, protection and stewardship, and expand their network and connections at this mixer. Registration is required. Call Land For Good at 603-357-1600 or register now at landforgood.org/rsvp. Complimentary food will be provided, and you can buy some local brewed beer at this farmer mixer.